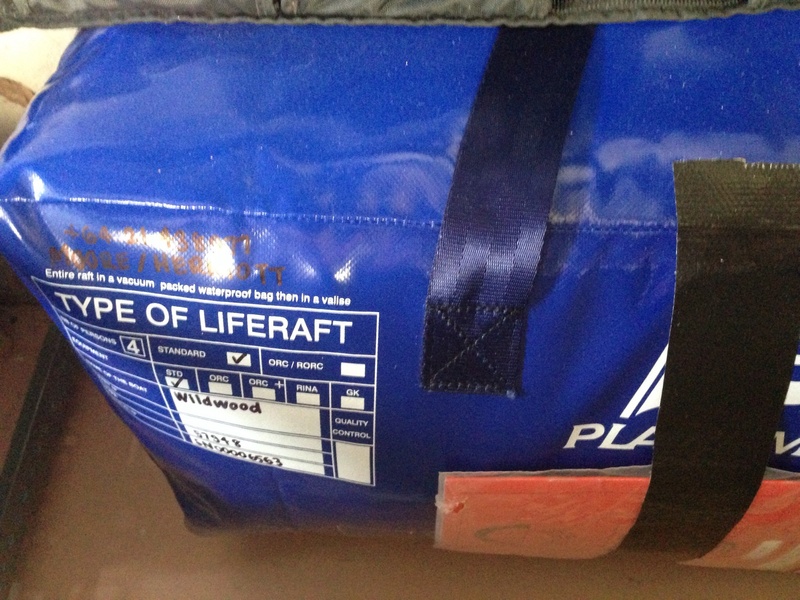 Our life raft is the most expensive thing we have ever bought that we hope we never have to use! We ended up purchasing a Plastimo 4 person cruiser life raft in a soft valise. Whilst we had the option of hiring a raft from the yacht club for our recent trip up the coast, but the effort involved getting it to and from Christchurch after each leg, or alternatively paying $50 per day to keep it with us – we decided that we would better spend our money on buying one for our future cruising needs. After lots of shopping around we found that it was going to be cheaper to purchase the life raft from Whitworths a chandlery in Australia and have it shipped to New Zealand. Whitworths weren’t overly keen on doing this as life rafts are classed as dangerous goods, so we had to arrange the shipping ourselves. But it still worked out considerably cheaper, so we went ahead. The raft arrived just before Christmas last year. It is a 4 man raft packed in a blue soft case and weighs 28kg, which is very heavy! During the passage we lashed in the cockpit, just inside the transom. When we reached our destination, we stowed it under the quarterberth, out of the sun and out of the way from people wanting to pinch it! Here are the minimum requirements of what Yachting NZ require to be in a life raft for Cat 1 safety requirements. In addition to all that stuff, we also have a grab bag full of all the other goodies you might want to take along with you. 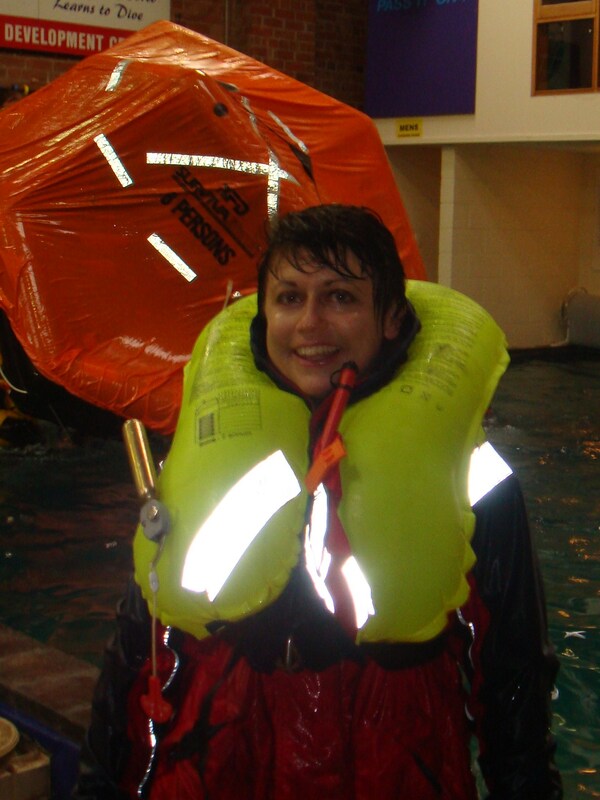 A few years ago I did an Advanced Sea Survival Course, part of which entailed doing a life raft drill in a pool. We all jumped in to the dive pool wearing our full wet weather gear and pulled the cords on our life jackets to see how that went. I must admit that even when you are expecting it to inflate, it gives you a big fright when it goes off! Pulling the cord on the life raft was an interesting experience as well. The line attached to the raft is actually quite long. Ensure that the bitter end of the raft is of course attached to your boat before you throw it in the water, or you could be in for a long swim. Launching and boarding a life raft in bad weather is extremely hazardous. There is no guarantee that the raft will work properly, stay afloat or be able to protect you in stormy seas. In very rough conditions life rafts can be washed overboard and lost before they can be boarded, or ripped from their stowage spaces – ie. on the deck or cabin top for example. Ensure that your raft is securely fastened so that they can not be accidentally dislodged. The other advice of course is that you should step up in to your life raft – meaning that you want to stay with your boat until the time it actually slips beneath the water. In one of the Sydney Hobart races, crew’s had opted to leave their boats and get in to the life raft. Sadly the rafts (and people inside) were never found, but the boats were found still floating days later. Doing the course was a good reminder of how grim life is likely to be inside a life raft. The one we set off was supposed to hold six people, but it was crowded with just four of us inside. Moving around is like trying to crawl on a waterbed. One of the other drills we had to do was to right a capsized raft. This was interesting as you ended up underneath the raft once it was righted and had to avoid being clonked on the head by the gas cylinder! Then getting inside was another experience in itself. Very difficult when wearing all your wet weather gear and a life jacket. I am sure the conditions would also be much rougher in the sea than in an indoor dive pool! However I am sure the adrenaline would help. You would also want to have a knife with you to cut the painter once the boat goes down. Taking care that you didn’t accidentally puncture your raft in the process! The supplies inside can be very sparse, so ensure that you take a well stocked Grab Bag with you. The most important thing to take with you is of course the EPIRB. Raft’s have to be surveyed on a regular basis. I have read horror stories of people having their raft’s surveyed in dodgy area’s and opening them up a few years later for the next survey and finding the container is full of sand instead of a raft! The other thing I have read is that the glue can melt on raft’s stored on deck in the sun or very hot conditions. There are some incredible tales of survival in life rafts. This book is an amazing account of a family’s 117 days adrift in the Pacific in their life raft after their boat was sunk by a whale. The other fascinating account of survival at sea is the story of the Rose Noelle. John Glennie and his crew spent 119 days adrift in John’s overturned Trimaran before washing up on Great Barrier Island – off the coast of New Zealand. John is a follower of our blog and is still sailing. This is a brilliant book, well worth a read. My absolute favourite story of survival would have to be Shackleton’s Boat Journey by Frank Worsley. Frank was the boat captain of the Endurance when it was trapped in ice in Antarctica. The story starts when the ship is eventually broken up and Shackleton, Worsley & the crew set out on an incredible boat journey through the Southern Ocean, firstly to Elephant Island, and then on to South Georgia. You can click on the pictures of the books to see more detail and to purchase. Do you have any personal accounts of survival, life rafts or a favourite book to recommend? I love reading these sorts of stories! I recommend “Adrift: 76 days lost at sea” by Steven Callahan. His life is preserved by unexpected things. I’m taking Roger Taylor’s approach with Tammy Norie and making her unsinkable. My principle is that if you cut her in half both halves would float. The boat is the best life raft and already has all the equipment in your list. I did a sea survival course that sounds just like yours. We also got to set off flares. I recommend it to anyone. There’s nothing like practical experience. As for adrenaline, it wears off fast, so the advice I’ve read is try hard first time. Good advice Richard, and thanks for the book recommendation, I will track it down! i can only imagine how vital the raft is! never found? i hadnt heard that story but how terrifying!